USAID isn’t the only bad actor willfully disregarding the FOIA – or dragging its heels to improve the FOIA process to keep embarrassing information out of public view. The FOIA Advisory Committee’s last meeting will be held on April 19, 2016 (register here to attend). The Committee’s biggest deliverable to date is working to update outdated OMB FOIA fee guidelines – that date all the way back to 1987. 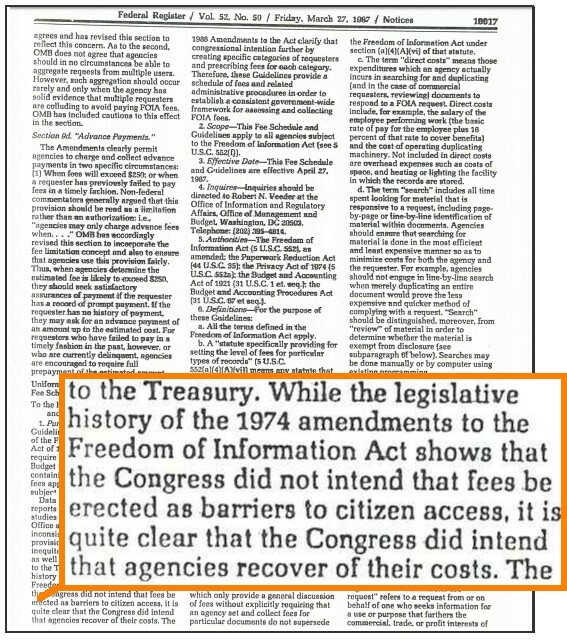 The DOD’s Jim Hogan, who is also the fees subcommittee chair, notes that the guidance is missing a key word: “While the legislative history of the 1974 amendments to the Freedom of Information Act shows that the Congress did not intend that fees be erected as barriers to citizen access, it is quite clear that the Congress did intend that agencies recover [word missing] of their costs.” Is the key missing word “some”, “half,” “most”, or something else? The Committee voting to rectify this lingering issue and bring the guidance into the 21st century will be of lasting importance. Haqqani Network (HQN) fundraising efforts have deep roots in the Gulf States and in the oil industry; the Pakistan Inter-Services Intelligence Directorate funneled $200,000 to HQN for an attack on the on the CIA facility at Camp Chapman; squabbles over low-level militants not giving kickbacks from ransom money to Haqqani leadership; and Hamid Karzai’s brother hooking a Haqqani informant up with a job at a US security base so the informant could provide details on US vehicles and personnel to the terrorist organization. 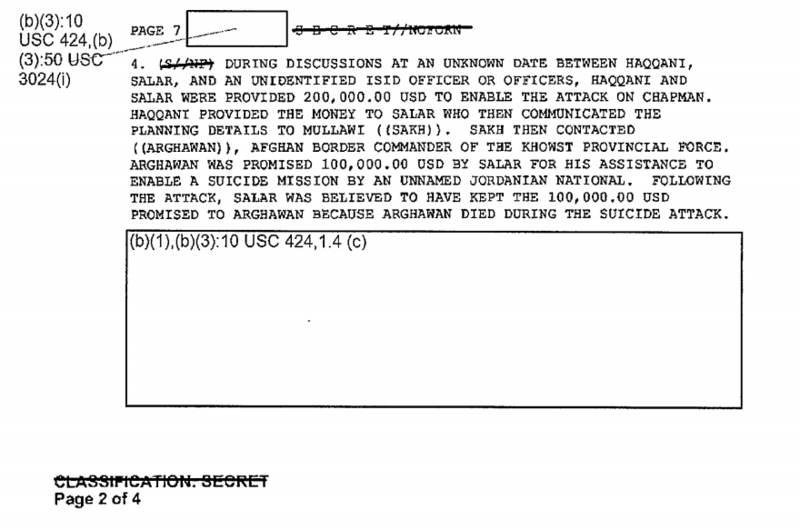 These are all details found in a fascinating collection of declassified documents obtained by the National Security Archive through the FOIA showing the Haqqani Network’s efforts to diversify its funding away from the foreign sources it relied on during the Cold War, including the CIA and Pakistani intelligence services, and towards more traditionally criminal activity. These documents were requested under the FOIA as part of the Archive’s Afghanistan, Pakistan and Taliban project, and we will continue to post on interesting documents as they come in. Duane “Dewey” Clarridge, a CIA officer who was involved in the Iran-Contra affair and helped found the agency’s Counterterrorism Center, is dead at 83. In his final report Lawrence Walsh – the independent counsel investigating Iran-Contra – found that “there was strong evidence that Clarridge’s testimony was false.” Clarridge, however, was pardoned by President Bush. Read highlights from Walsh’s final report, curated and analyzed by Archive staff, here. In the DC area next week? If so, register the American Society of Access Professional’s event celebrating the 50th anniversary of FOIA! Entitled “Food for Thought” the lunch event will be held at Carmine’s and will feature Michael Lemov, who served for eight years as chief counsel to John Moss, the father of the Freedom of Information Act. Lemov has authored the definitive history of John Moss and the Freedom of Information Act, People’s Warrior: John Moss and the Fight for Freedom of Information and Consumer Rights, and will regale attendees with a history of the battles that had to be fought to make FOIA a reality, and what the hopes at the time were in implementing the FOIA. This week’s #tbt document pick is from the Archive’s newly-launched Cyber Vault, and is a February 11, 1970, Defense Science Board report on security controls for computer systems. 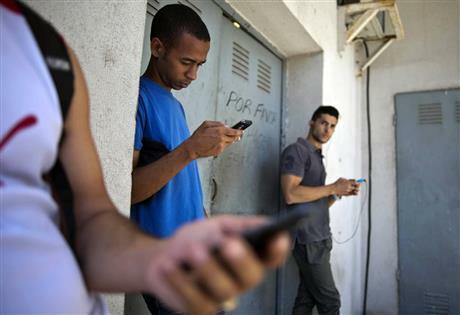 Among the conclusions reached was that contemporary technology could not provide a secure system in an open environment, and that it would be unwise to incorporate sensitive information in an open environment system unless a significant risk of accidental disclosure could be accepted.